Erin Hart is a Minnesota theater critic, former communications director of the Minnesota State Arts Board, and a founder of the Twin Cities Irish Music & Dance Association, Erin Hart received an M.A. in English and creative writing from the University of Minnesota and a B.A. in theater from Saint Olaf College. She lives in Minnesota with her husband, Irish button accordion legend Paddy O'Brien, and makes frequent visits to Ireland, carrying out essential research in bogs, cow pastures, castles, and pubs. Visit her website here. An ancient volume of philosophical heresy provides a motive for murder in this haunting, lyrical novel of forensics, archeology, and history—the fourth in an acclaimed suspense series. What sort of book is worth a man’s life? After a year away from working in the field, archaeologist Cormac Maguire and pathologist Nora Gavin are back in the bogs, investigating a ninth-century body found buried in the trunk of a car. They discover that the ancient corpse is not alone—pinned beneath it is the body of Benedict Kavanagh, missing for mere months and familiar to television viewers as a philosopher who enjoyed destroying his opponents in debate. Both men were viciously murdered, but centuries apart—so how did they end up buried together in the bog? While on the case, Cormac and Nora lodge at Killowen, a nearby artists’ colony, organic farm, and sanctuary for eccentric souls. Digging deeper into the older crime, they become entangled in high-stakes intrigue encompassing Kavanagh’s death while surrounded by suspects in his ghastly murder. It seems that everyone at Killowen has some secret to protect. 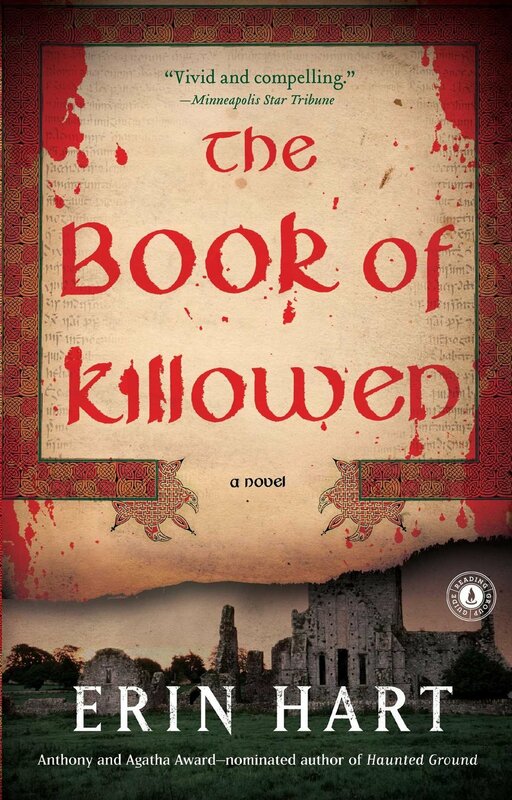 Set in modern-day Ireland, The Book of Killowen reveals a new twist on the power of language—and on the eternal mysteries of good and evil. American pathologist Nora Gavin fled to Ireland three years ago, hoping that distance from home would bring her peace. Though she threw herself into the study of bog bodies and the mysteries of their circumstances, she was ultimately led back to the one mystery she was unable to solve: the murder of her sister, Tríona. Nora can’t move forward until she goes back—back to her home, to the scene of the crime, to the source of her nightmares and her deepest regrets. Determined to put her sister’s case to rest and anxious about her eleven-year-old niece, Elizabeth, Nora returns to Saint Paul, Minnesota, to find that her brother-in-law, Peter Hallett, is about to remarry and has plans to leave the country with his new bride. Nora has long suspected Hallett in Tríona’s murder, though there has never been any proof of his involvement, and now she believes that his new wife and Elizabeth may both be in danger. Time is short, and as Nora begins reinvestigating her sister’s death, missed clues and ever-more disturbing details come to light. What is the significance of the "false mermaid" seeds found on Tríona’s body? Why was her behavior so erratic in the days before her murder? Is there a link between Tríona’s death and that of another young woman? Nora’s search for answers takes her from the banks of the Mississippi to the cliffs of Ireland, where the eerie story of a fisherman’s wife who vanished more than a century ago offers up uncanny parallels. As painful secrets come to light, Nora is drawn deeper into a past that still threatens to engulf her and must determine how much she is prepared to sacrifice to put one tragedy to rest . . . and to make sure that history doesn’t repeat itself. Barnes & Noble Staff pick for best crime novel in 2004. American pathologist Nora Gavin has come to the Irish midlands to examine a body unearthed at a desolate spot known as the Lake of Sorrows. As with all the artifacts culled from its prehistoric depths, the bog has effectively preserved the dead man’s remains — his multiple wounds suggest he was the victim of an ancient pagan sacrifice known as “triple death.” But signs of a more recent slaying emerge when a second body, bearing a similar wound pattern, is found–this one sporting a wristwatch. When farmers cutting turf in an Irish peat bog make a grisly discovery—the perfectly preserved head of a young woman with long red hair—Irish archaeologist Cormac Maguire and American pathologist Nora Gavin must use cutting-edge techniques to preserve ancient evidence. Because the bog’s watery, acidic environment prevents decay, it’s difficult to tell how long the red-haired girl has been buried—two years, two centuries, or even much longer. Who is she? The extraordinary find leads to even more disturbing puzzles. The red-haired girl is not the only enigma in this remote corner of Galway. Two years earlier, Mina Osborne, the wife of a local landowner, went for a walk with her young son and vanished without a trace. Could they, too, be hidden in the bog’s treacherous depths, only to be discovered centuries from now? Or did Hugh Osborne murder his family, as some villagers suspect? Bracklyn House, Osborne’s stately home, holds many secrets, and Nora and Cormac's inquiries threaten to expose them all.